I had a delicious meal with my Cooking Light group yesterday. 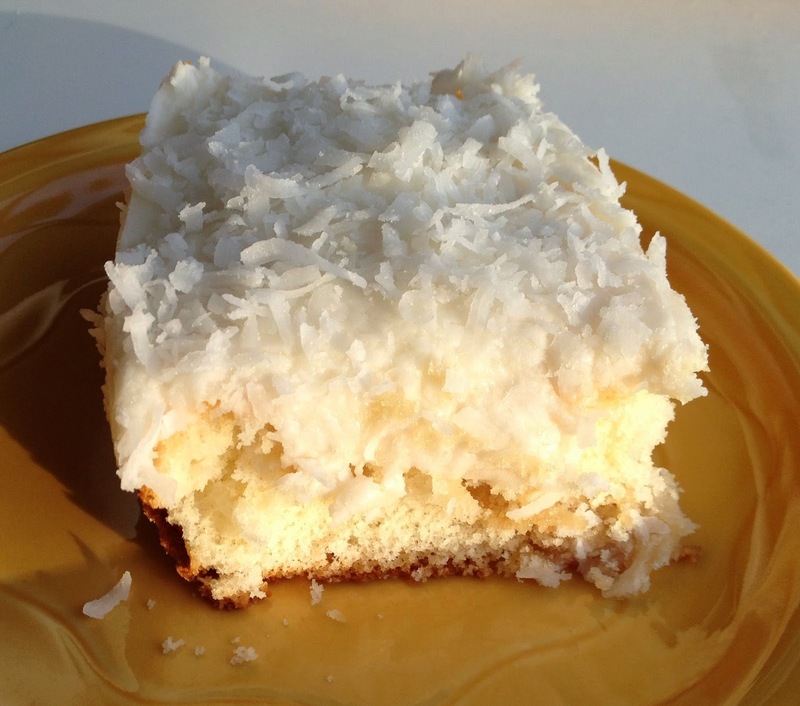 Our dessert was this coconut cake, which was easy, absolutely delicious and somewhat light (I wouldn't call it "healthy" but it's not as loaded with fat as some other desserts). We remarked that it would be easy to color the coconut green for Easter and garnish it with some jelly beans or other candies. If I was hosting guests that liked coconut, I'd totally go that route. That's not the case, though, so I'll save it for another time! Preheat oven to 350°. Coat a 13 x 9-inch baking pan with cooking spray; dust with flour. Combine cake mix and next 5 ingredients (cake mix through egg); beat at low speed of a mixer for 30 seconds. Beat at medium speed for 2 minutes. Pour half of batter into prepared pan. Sprinkle with flaked coconut and brown sugar; top with remaining batter. Bake at 350° for 30 minutes or until a wooden pick inserted in center comes out clean. Beat cream cheese and vanilla at high speed of a mixer until creamy. Gradually add the sugar, beating at low speed until well-blended. 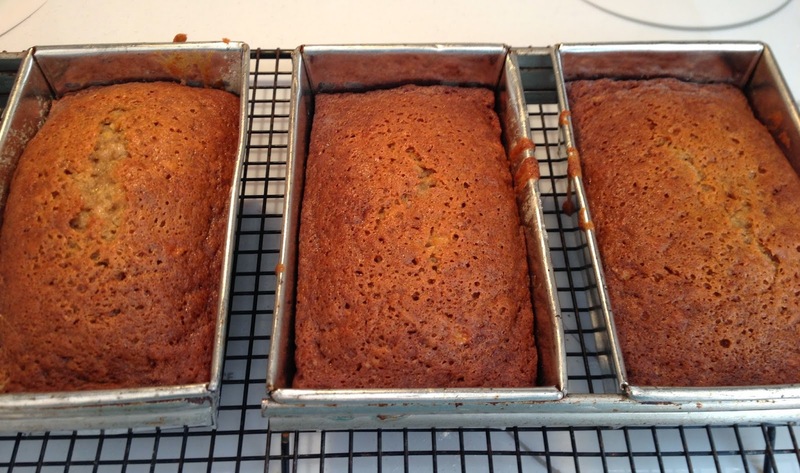 During one of the many snowstorms during the past winter, I wanted to bake a comforting banana bread. All of my usual recipes, though, included ingredients, such as buttermilk, that I didn't have in the pantry or fridge. There way no way I was venturing out, so I searched the internet for a recipe the called for only the basics. I found this one on a lovely website called Urban Comfort. I adapted made it into mini loaves in an effort to exercise portion control. I'm not sure it was effective in that regard, but at any rate it was moist and just sweet enough. I'm sure it will be a part of my regular banana bread rotation. Preheat the oven to 350 degrees. Butter and flour (or spray) a 9-by-5-inch metal loaf pan (or mini pans). In a medium bowl, whisk the 1 1/4 cups of flour with the baking soda and salt. In another bowl, whisk the eggs with the oil, sugar and mashed bananas. Stir the banana mixture into the dry ingredients. Scrape the batter into the prepared pan(s) and bake in the center of the oven for about 50 minutes, until the bread is golden and a toothpick inserted in the center of the loaf comes out clean. Transfer the pan to a rack and let cool for 15 minutes, then turn the bread out onto the rack and let cool completely. If you are using mini loaf pans, start checking at 30 minutes.